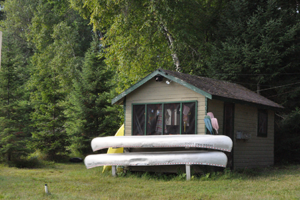 We provide a boat rental with every cottage rental, personal flotation devices, Lake Maps, and a fish-house to clean your catch! Eight H.P. motor rentals are available for daily or weekly rates. ** Pontoons may only be reserved in advance for weekly rentals. Licensed guide services are available from our staff. Contact us for rates, availability, and reservation.